Fire Protection Shop supply a range of both the the Fire Hose Reel Cabinets and Covers, all manufactured to the highest quality and to ensure full protection. All covers are designed to fit most 19mm and 25mm Fire Hose Reels, manufactured to a high standard and are easy to fit. The Flexible Hose Reel Covers are manufactured from strengthened PVC, ideal for protecting a Fire hose Reel in harsh environments and are easy to fit and rapid removal disgn. 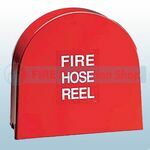 The Rigid Fire Hose Reel Covers are manufactured from strong GRP construction, high gloss finish and are suitable for rear-mounted fixed and swinging Fire Hose Reels. The Cabinets designed and built to provide long lasting protection for Fire Hose Reels. These Cabinets will house all makes and models of 19mm and 25mm Swinging Fire Hose Reels. 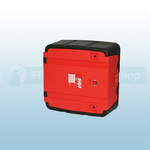 The Fire Hose Reel Box can be used indoors or outdoors and is ideal for harsh environments such as abattoirs, chemical factories and marine environments etc.